Week three of Berlin Marathon Training is in the books. If you follow me on Instagram, you probably saw that I spent the end of the week in California, celebrating my niece’s graduation from high school. We were in the suburbs, but surrounded by highways so I knew running would be a bit dicey. I set a goal to get in two runs while I was gone and I hit that goal – success! 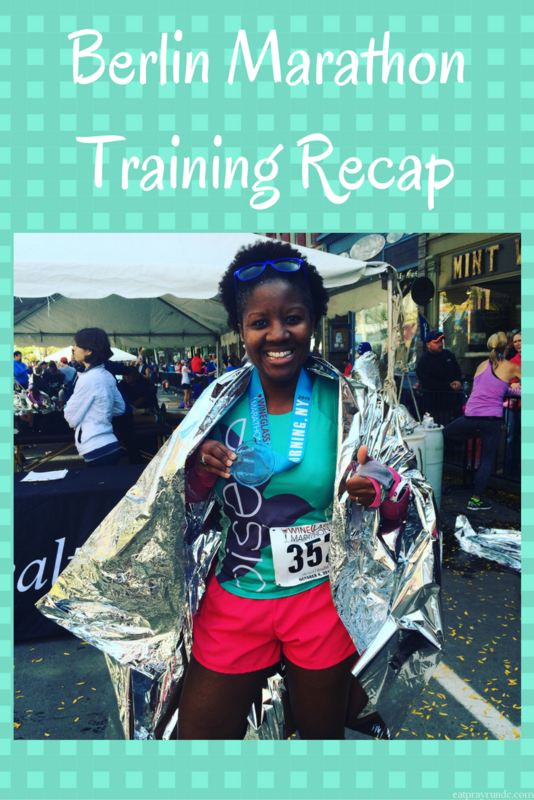 Remember that you can find these training recaps each Sunday and please do join in the link up! Monday: 4 miles, with a stop to the Congressional Cemetery. I know it might sound weird, but it’s so peaceful to run there. I really love it. While the Congressional Cemetery is still an active, working cemetery, it also is an off-leash dog park. So it’s great to run there because I always get to see cute, well-behaved dogs. My kind of place! Tuesday: 4.65 miles from work to (and including) the Whole Foods Run Club. Another fun run with that group! I wanted to take advantage of the run club because I won’t be able to attend for the next couple weeks. Wednesday: Global Running Day! We celebrated with a fun Oiselle team run on the National Mall. 4 fun miles! Thursday: Rest – flight to CA that took basically all day but it was worth it! Friday: 3 easy in CA. Saturday: 3 easy in CA. Sunday: Rest – flight back home. Sad face. Anyone else celebrate a graduation recently? I always get emotional seeing the graduates! Congrats on another good week of training and getting in your runs while in CA. I did run on Wednesday but on the treadmill which I did not mind. Now I have that song in my head! LOL! That was on my training playlist for Big Sur. Gives me goosebumps when I hear it now. Happy for you that you got to see your niece graduate and get some runs in as well! I agree, I used to teach high school and I always loved graduation time (and not just because it meant school was out for summer haha)! I’m so bummed I missed the meet-up on Wednesday. Totally agree about graduations getting to you – this time of year I always see people posting about them (and we had a graduate in the fam this year, too) and it always brings up lots of feelings – happy, nostalgic…and then OLD! 🙂 See you Sat!! My son’s girlfriend just graduated from college. So proud of her and excited for the career she will be pursuing! She’s very public-service minded and we need young, enthusiasm to help get us on the right track. Congratulations on your niece’s High School graduation! SO wonderful that you could be there AND still manage to squeeze in some runs! Well done! How exciting that you got to be in California for your niece’s graduation. Family gatherings with extended family are always so much fun! Great job getting some miles in without a good running route in a new place! Nice that you got to spend time with family for a few days. Being a teacher, I go to each graduation as part of my job. I get SO emotional each and every year. I haven’t been to a graduation in awhile. I actually think the last one I attended was my husband’s college graduation a few years ago. But I do agree, it’s very inspirational and sometimes the speakers have good stuff to say (except at my graduation, but we were all too hung over or still drunk to listen, haha). Despite traveling you got some strong runs in, and I don’t blame you to take it a little easier in Cali because safety is always the #1 priority and I don’t like to run strange places.